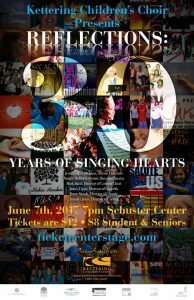 Join the Kettering Children’s Choir as they celebrate 30 Years of Singing Hearts! This monumental concert will highlight the incredible legacy of Dr. Natalie DeHorn, Artistic Director Emerita and Founder of the KCC, and will serve as the official passing of the baton to the organization’s new artistic directors, Mark and Jennifer Jauss. 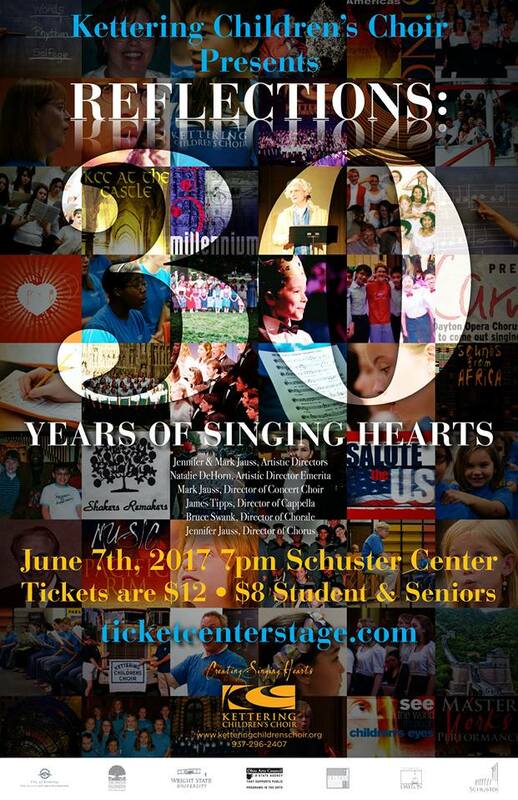 The choirs of the KCC will be singing some of their “greatest hits” from the last 30 years, including songs requested by Dr. DeHorn, and several alumni will be featured as speakers and soloists. This one-time only concert will also feature members of the Dayton Philharmonic Orchestra and Maestro Neal Gittleman, guest conductor, at the Schuster Center, on Wednesday, June 7, at 7:00 p.m.
Tickets are $12; $8 for Students and Seniors www.ticketcenterstage.com If you need to order student or senior discount tickets, you need to CALL Ticket Center Stage at 937-228-3630 to reserve them.